Few sectors in the world are as competitive as real estate. The quality of online property listings and the accuracy of search results on websites can provide real estate agencies incomparable advantages over competing portals. Property buyers and renters are increasingly tech savvy. They expect to search online for places in which to live or invest the same way they query human real estate agents: in their own words. And they expect results as rich and detailed as their own expectations. Image recognition technology provides online real estate portals the depth of specialized insight that until now has been the sole domain of real estate professionals with years of experience. The technology promises to separate websites customers value from those they consider obsolete. Restb.ai’s image recognition technology identifies, tags and describes properties the way real estate agents do. The artificial intelligence (AI) technology recognizes and organizes settings with references that real estate professionals use everyday. The technology understands property-related contexts to a level of detail approaching that of many real estate professionals. How is Restb.ai’s solution different from the mainstream incumbents? Most image recognition technology only sees generic objects in photographs. For instance, it will decompose a photograph of a living room into basic components: a sofa; windows; chairs; a table; wood; a lamp. Clearly, a generic approach to analyzing photographs has limited appeal to real estate agencies; it adds no value to the journey of a buyer searching for his or her dream house. Who really cares if there is a chair in a room? Instead, real estate agencies need to build websites that deliver results to very detailed queries. Websites need to offer answers that are specific and relevant. 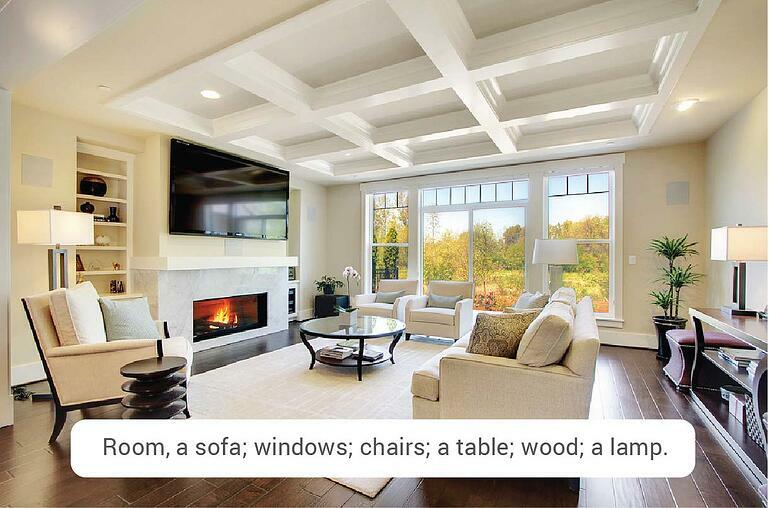 Increasingly, customers want a narrow set of responses that reflect interests like a “living room with a fireplace”, instead of just random shots of interior rooms. Or, instead of just “table, chairs, and windows”, the website would recognize the context in which the table and chairs reside; namely, a “living room with natural light”, or whatever terminology an experienced real estate agent uses that she knows her clients will value. Restb.ai’s specialized image recognition technology pushes the boundaries of Deep Learning. It was designed from the ground up to accurately recognize complex concepts within a specific context, and, in turn, can precisely tag over 30 home scenes and over 30 home features. The ultimate goal being to use computer vision to tackle a problem within a specific industry in order to provide real value to its stakeholders, in this case real estate customers. Deep Learning builds AI’s body of knowledge about specific industries by constantly drawing associations between objects, their relevance to real estate contexts, and their accuracy in returning search results. 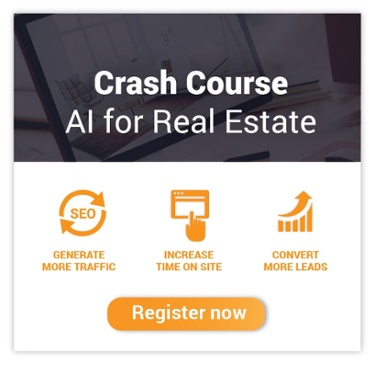 AI literally learns what contexts are meaningful to real estate websites. Rich, detailed search results honed by specialized industry knowledge provide unparalleled insights into property listings. So, image recognition based on deep learning algorithms are able to distinguish the value of a cat in a photograph of a fireplace from, for instance, a “red brick in-built fireplace”. The cat is irrelevant to the real estate property context in the example. 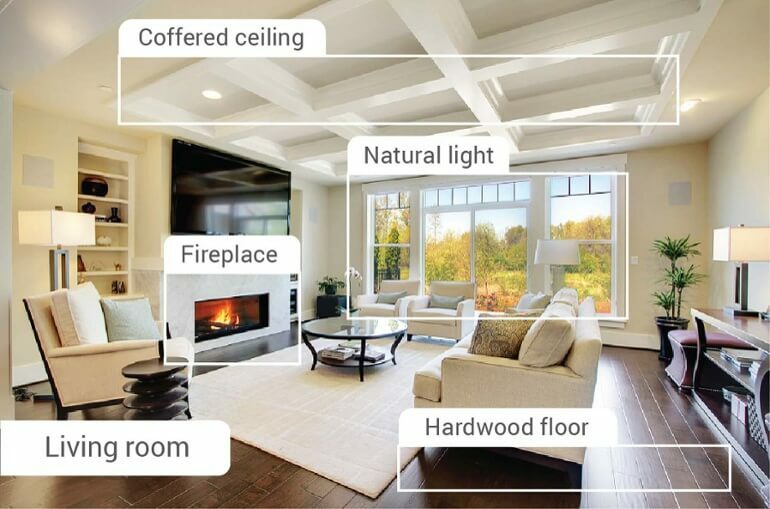 Restb.ai’s image recognition software would exclude the cat from the catalog of attributes about the property, and include the real estate context that best described the fireplace setting. Real estate agencies that operate websites with photographs of available properties benefit markedly from AI deep learning. The relevance and richness of real estate contexts that Restb’s AI builds up provides companies an advantage over competitors who provide simple, keyword-driven property listings. Internet users are increasingly using their own words to ask for search results from websites. They are thinking less about keywords and more about concepts and contexts. They are transferring the expectation to ask questions the same way they think or speak to searches through online portals. Real estate customers are also expecting their search results to be relevant and rich in content. Websites that do not meet these customer expectations risk losing visitors within seconds. However, real estate websites that welcome sophisticated real-world searches and offer context-sensitive results will see increased, longer-lasting traffic to their listings. Satisfied users will of course refer valuable property websites to other people looking for new homes - an image any business recognizes as success.